Christmas is nearly upon us all it's the time of year we all get together with loved ones give and receive presents and most of all importantly over consume in food and drink. Many people around this time of year tend to relax a bit more and tend to not worry about what they put in their mouths and then worry about the consequences in the New Year! Well, I'm going to change that for you all, don't just let a certain holiday ruin your goals and your diet you can still have a few naughty treats and stay on track it's just knowing how to and what to do so that's what we are going to be talking about today. The average British person on Christmas day believes they only consume 3,000 calories but in reality, they will eat 7,000 calories in just one sitting and that's not including breakfast and the booze, crisps, chocolate to go with it and desserts! Wow, that is a lot of calories and we don't even think about how many we are consuming? I always think if you wouldn't burn off the food you eat then why eat it in the first place it would take more than 10 hours of running, cycling at more than 20mph for seven hours, climbing stairs for eight hours and skipping for 12 hours to burn off the 7,000 calories consumed on Christmas Day. Would you do all of that to make use of your over consumption of calories? However, According to new research, most people have no idea that they will triple their recommended daily calorie allowance (2,000 for women and 2,500 for men) on the most indulgent day of the year. You can see why many people pile on the pounds over the festive period. But there really is no need to here I'm going to give you a few simple tips on how to cut calories and still enjoy yourself. 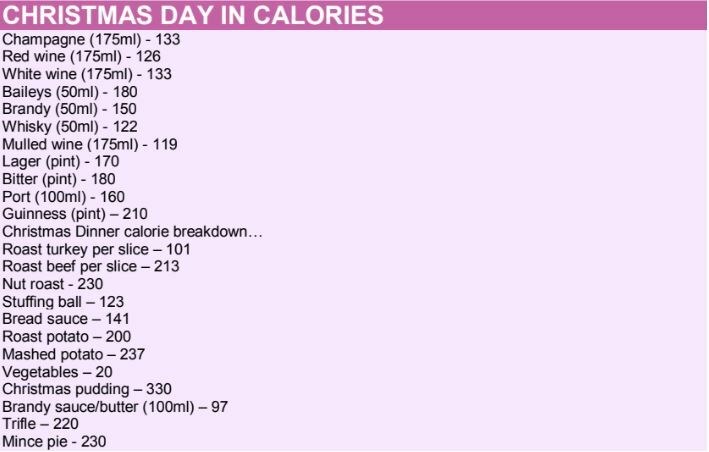 Here is a rough idea for you to see how the calories do add up now do you believe me? Here are some tips on how you can cut Christmas day calories without feeling like a dietary scrooge! Swap white bread for brown to add fibre to your breakfast, and bulk up on the eggs with a chopped tomato for extra nourishment. You can afford to be a bit more relaxed with Christmas dinner itself, which is fairly well-balanced, containing lean protein, starchy carbohydrates and plenty of veg - but try to avoid the fattier parts of the meal, such as the pigs in blankets and crispy turkey skin. Swap roast potatoes for boiled or even better go for sweet potatoes as it has more fibre and is low on the glycaemic index. Aim to have low -calorie non-alcoholic drinks (water is ideal!) between each glass of wine, or drink white wine spritzers instead. Go easy on the cheese. Try having a small amount of the strongest one available, such as Stilton or Roquefort - this will make you feel more satisfied than a large amount of a mild cheese would. That Christmas party is coming up fast! Your first instinct may be to slash your calories, but wait that is so wrong. Of course it's not healthy, but it's not effective, either! Not only that…you feel hungry all day, grow irritable, become grouchy, sleep intermittent, and to top it all off your just starving your body. Look at it this way would you put £10 of fuel in your car and espect to drive 200 miles. NO… well neither will your body be able to function, work and train on 400kcals a day. There's a better way and your going to like it. Nutrition plans that cycle carbohydrates are common among fitness athletes, and there's so much research out there to support this method commonly known as carb cycling. The carb cycling strategy alternates high and low carb days. This stimulates the body's production of the fat-burning hormone leptin. Not only are you allowed to eat carbs it is also incredibly mentally rewarding! It gives you a higher carb day to look forward to, which helps you stick with your plan. Introduce your high-carb days on the days you perform your hardest workout sessions. That’s good right you get to look forward to high carb days and still lose weight. Additionally, any time you make fat loss your goal, you risk losing plenty of fat burning muscle tissue along with the soft stuff. A healthy protein intake (do not replace your meals with your shakes) and supplemental BCAAs can both help you hold on to lean mass, while the BCAAs can also help with recovery between your workouts. When someone wants to lose fat, particularly by an ambitious deadline for holidays, wedding’s, Christmas, birthday’s “I wanna lose a stone by next week” you name it I’ve heard it, the first supplement that usually comes to mind is a fat burner. While this can definitely help and I’m not saying rule it out, it's a tool that should only be used when you have your nutrition and training on point. Cover those crucial nutritional bases first, and you'll give your fat burner and your workouts a better chance of working for you. Right now if you have started a plan or planning it you’ll probably have your resistance session and a high intensity cardio sessions planned out. Sure, that burns calories, but are you really getting the most out of your workouts. If fat loss is your goal, you don't need to dread those cardio sessions. Fat loss is all about burning the optimum amount of fat per minute of each workout. Everyone is different and will require a different intensity cardio session for their optimum fat burning potential. Slow intensity cardio also known as “steady state cardio” in a fasted state (preferably morning) will constantly offer far better fat burning potential than slogging your guts out running for an hour on a treadmill. High intensity cardio has its benefits and is certainly not to be ruled out but for fat loss stick to steady state.